As any bride and bride-to-be knows, planning a wedding is not a piece of cake and in my bride-opinion the cake shouldn’t be either. When we went looking for our wedding cake, we were really disappointed at what was being given to us at the cake tastings. For some reason we were expecting more than what was presented. Your typical choices are white, yellow or chocolate cake, and then maybe they will throw in a carrot cake and/or red velvet cake with either a butter cream, cream cheese, and fondant frostings. These are your choices for about $3-4 a slice. You want flowers or decorations? Add on more money for those. You can easily spend $400 or more on what I find is an overpriced birthday cake. Don’t get me wrong, I watch Cake Boss like the rest of you and I LOVE how they make the cakes and I understand that it takes a lot of skill to make flowers and sculpt figures out of fondant and frosting, but not only did we want our cake to look good, we wanted people to really love the taste of it. I scheduled us for two cake tastings near our house that were pretty popular. The first place gave us two plates of cakes and frostings as described above, and then our consultant left us to our cakes to do something else and never really came back. 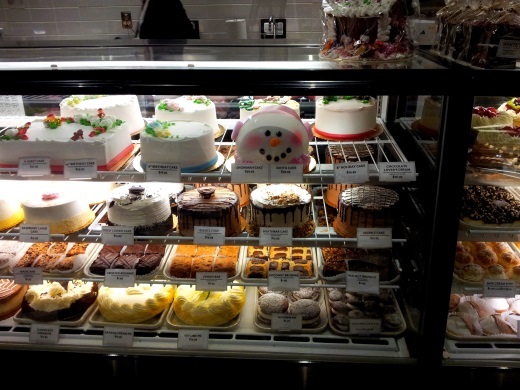 The cakes were kind of dry and the frostings were way too sweet. I think my teeth almost fell out. That’s not the type of cake we wanted to serve to our guests. We ended up leaving the establishment before our consultant came back. My now husband kept telling me that this was not the cake he wanted for the wedding, but as I also have never been to a cake tasting we decided to see what bakery #2 had in store for us. Bakery #2 was promising, at least our consultant stayed with us the entire time and was patient enough to show us pictures of previously made cakes. She also brought over cakes to taste, but again, same problem. Run of the mill birthday cake type stuff that would cost us $400, and $20 per flower or something ridiculous like that. 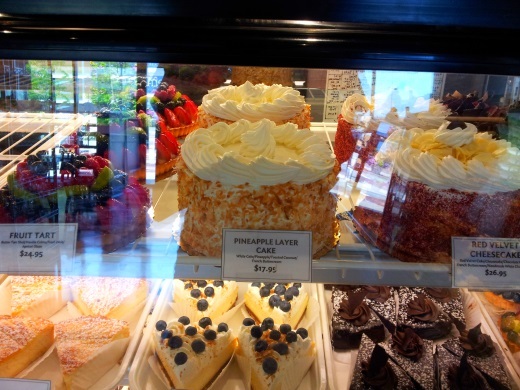 If I’m dropping hundreds of dollars on a cake that makes my wallet cry, I want my taste buds to sing! At this point my then fiance and I were stuck. My mom was freaking out because we had not taken care of the cake yet and it was a month before the wedding (see this article about how my lovely mother gave this wedding a swift kick in the bum). Pressure? What pressure? 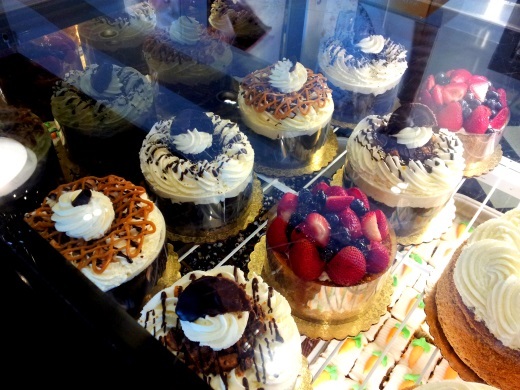 A torte is a cake, but a cake is not necessarily a torte….a torte is better. 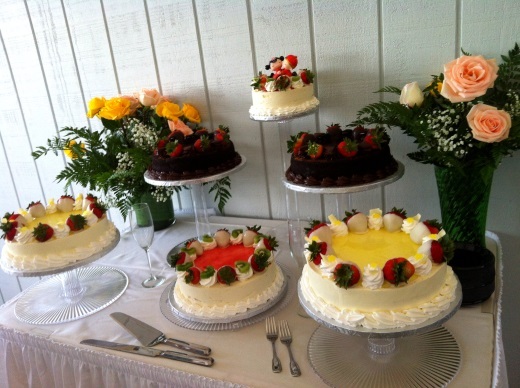 Since they were there, we tried the cakes that were given to us and had to admit that White’s Bakery’s selection of wedding cakes tasted much better than what we had been offered in the previous establishments. That being said we still decided to make our own cake tasting. We bought six different slices of their tortes: Midnight Madness (as Jimmy Prudente, our wedding photographer, said speaking of his wife’s love of chocolate: Chocolate cake, stuffed with chocolate, topped with chocolate, then deep fried in chocolate) minus the fried chocolate part that was what the Midnight Madness torte was, then there was the Oreo Cheesecake, Lemon Mousse, Tres Leche, Raspberry Cheesecake, and Heathbar. Our consultant even gave us one of the slices on the house as part of our original cake tasting! Such customer service. We sat down with our two boxes of goodies and happily tried each one of the slices. Now THAT is a cake tasting! They were all so delicious!! We thought it was going to be tough to decide. However, since our wedding was going to be a summer wedding (July 4th to be exact) we wanted something light and summery. We both readily agreed that the Tres Leches would be one of the cakes. Notice I said “one”. We decided we were going to have a taste bud explosion wedding cake with a few choices for our guests to choose from because like the Intention Ring, not everyone has the same tastes. Next up, the Lemon Mousse was my fiance’s favorite. He said it was one of the best Lemon Mousses (Plural?) he’s had since Athan’s Bakery. For the chocolate lovers we went with the Oreo Cheesecake. Still light, but chocolatey. So we chose three awesome cakes, sorry, tortes for our wedding! A quick search on eBay led us to these beautiful 6 tier cascading cake stands. We ordered the stands, and then two of each torte. Chris, the Pastry Chef, and my fiance discussed how the tortes would be made to look uniform and wedding-like. We had them set for delivery to the ceremony space at the Quincy Adams Inn. 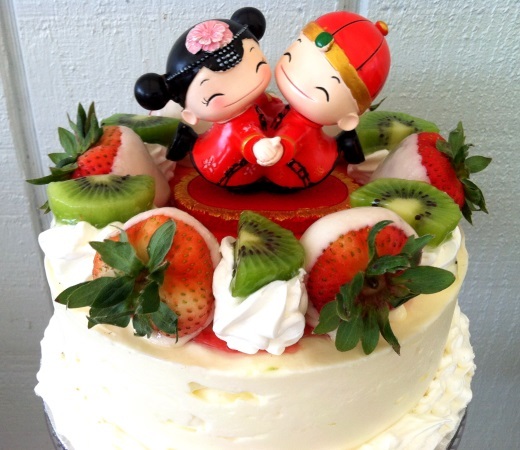 On the day of the wedding, the tortes were delivered nicely frozen so they kept their shape during the very hot and humid day. Mind you we didn’t have them brought out until it was time to cut them for fear that they would melt before anyone had a chance to see how beautiful they were. 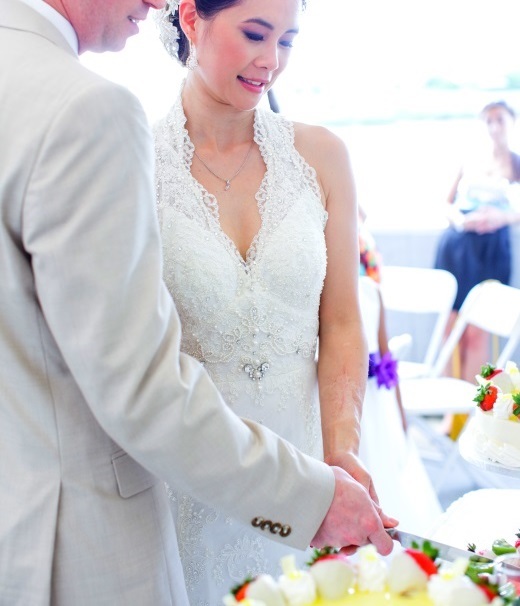 Having the tortes instead of a typical wedding cake was a much better choice for us. We paid more or less the same as we would have for a regular wedding cake and had more selection of tastes. Our guests have not stopped raving about the taste of the tortes and how beautifully they were presented. Just what we wanted. Thank you White’s Bakery and Chris!!! E-Rating (1-meh; 5=Eenae Endorsed): yumEEEEE!!! !